I am a hunter-naturalist when I go fishing. I like to boat the variouswaterways where I have had previous fishing success and watch high flyingwildlife predators working as they too hunt for their prey. These predatorsprovide important clues to the movement of the aquatic prey species andhelp me locate underwater predators like trout and salmon that are alsohunting. One particular aerial predator that always causes me to pause andwatch with keen enjoyment is the Osprey. This high flying raptor, oftenreferred to as the 'Fishing Eagle', or, 'Fish Hawk', displays fishingskills that are the envy of all. I find it uncanny how they are able to spot fishswimming near the surface and target them for a free dive even during timeswhen there is chop on the water. However, I do appreciate this skill for itusually means that there are salmon grilse or surface swimming troutnearby, and, if there are grilse, there are also adult salmon in the area.For me Ospreys are one of nature's fish indicators that help with my openocean salmon angling or my stillwater trout fishing. The Osprey is native to all regions of the earth except the polarareas. They have adapted to catch and feed almost exclusively on fish.Their legs and feet are notably different from other hawks in that theyhave a reversible outer toe. The Osprey can rotate its outer front toewhich allows it to grasp fish with two toes in the front and two toes inthe back. All other hawks have three toes in the front and one in the back.This unique toe structure makes it easier for the Osprey to carry"tubular-shaped" fish head first during flight. As well, the underside ofthe toes are covered with spicules or tiny projections that help in holdingslippery fish while in flight. I have been fortunate to witness the actual capture of a fish by anOsprey on a number of occasions. It is truly dramatic! Generally the ospreyhave been circling a particular area at between 50 to 100 feet. Then, whenit appears that they have their prey in a position for capture, the Osprey hasdropped like a stone, smashing into the water in what can only be calledone of nature's most explosive belly-flops! The spray of water completelyobliterates the bird. Then, with light underwings flapping and white breastflashing, the Osprey struggles out of the water, climbing to reach asuitable distance above the surface before it gives a thorough drying shaketo disperse the water. It has been a rare time that I have seen them miss acapture. With fish in its claws, now is the time when other predators andscavengers dive in on the encumbered Osprey. 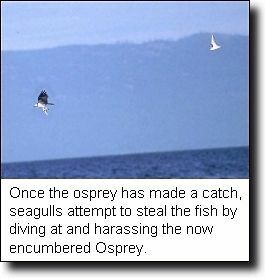 I have watched seagullscommonly attack the Osprey in this vulnerable position. It appears thatonly later, when the Osprey has reached some elevation that the bald eaglewill dive at the Osprey, trying to make it drop the fish which the eaglewill then chase. Last summer I watched a struggling osprey fly towardsshore with a fish that I would estimate at close to two pounds. Just as theosprey began to fly over the shore a pair of bald eagles began theirconcentrated attack in an attempt to make the osprey drop the fish. Firstone eagle and then the other would dive down on the osprey while the ospreyswerved to fend off the much larger raptor, but, to no avail. Eventuallythe osprey dropped his catch with a sharp cry of frustration and theattacking eagle fluttered down to the beach to land by the fish. Theexperience of hunting raptors is one of those true life adventures that Ialways feel most fortunate to observe and share. 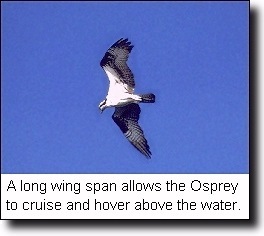 Observations by scientists have shown that the Osprey plunges inthe water feet first with the wings held above the head. Having made acapture, the Osprey then rises from the water with the fish locked in bothfeet. 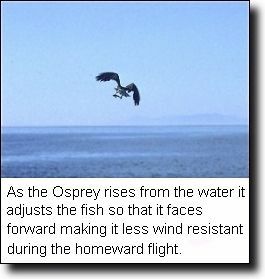 It is while the Osprey is in flight that it arranges the fish so thatthe head is pointed forward thus reducing resistance to airflow.Western ospreys migrate in the spring from wintering sites in CentralAmerica and northern South America. They mate for life, usually in theirthird year. The nest is large, built from sticks and other material at thetop of a sturdy tree, usually near water. Three buff colored eggs are thenorm. The female does all the incubation while the male provides fish forher, himself and the fledglings in their first month until the female isready to hunt again. The Osprey like many other raptors such as the bald eagle and theperegrine falcon were greatly affected by the pesticide DDT in the 1960'sand 1970's. DDT was widely used for agriculture and forestry until it wasbanned in the late 70's. The affect of DDT, which is not water soluble andaccumulates in the food chain, was the interference with calcium productionin the female Osprey, necessary for egg strength. The results were thineggshells that eventually crushed under the weight of the incubatingfemale. According to the Canadian Wildlife Service, "It is the Osprey'slong life expectancy that enabled it to survive through those years ofheavy pollution, despite low productivity. The Osprey acts as a biologicalindicator of environmental problems. As long as we continue to act onthe signals that this and other indicator species provide about thecondition of the environment, populations of Ospreys and many othersensitive bird species will remain." Remember, the next time you pull out a Canadian $10 bill, look onthe back at the featured Osprey and recall this greatest "Fisher ofFishers"!